A few days ago, I pointed readers to a story on Jeff Shyluk's Visual Blog that showed how Jeff had made custom skins for The Sims back in the early 2000s. And now, thanks to Allan Sampson, I'm sharing a glimpse of how Jeff's very abstract-looking art looked when overlaid onto the Sims in-game models. 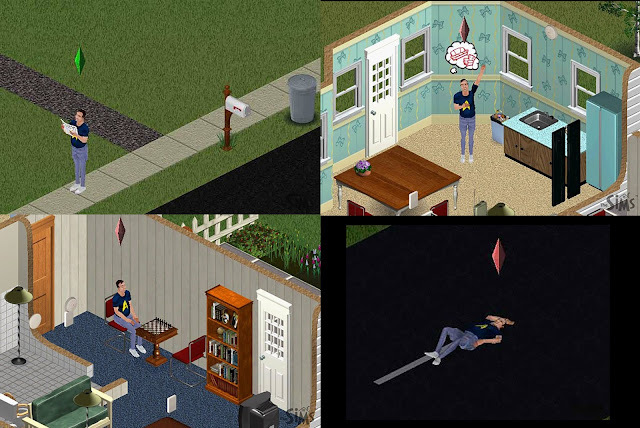 Allan shared four screenshots of SimEarl in various stages of content (reading a newspaper, upper left) or distress (lacking nice furniture, playing chess in lonely solitude, and passing out in the street). I'm very grateful to Jeff for creating the Sims skins in the first place, and to Allan for capturing these screenshots.